When Lenovo came out with the ThinkPad X1 Carbon, it seemed like precisely the sort of thing ThinkPad fans had been waiting for: an ultraportable with fast performance, a crisp 1,600 x 900 screen and, of course, one well-engineered keyboard. In fact, we deemed it one of our favorite Ultrabooks -- not just for businesspeople, but for everyone. The thing is, it arrived just before Windows 8 went on sale, which means four months after its release it's already a bit outdated. Enter the ThinkPad X1 Carbon Touch: it's more or less the X1 Carbon you know and love, except it has a touchscreen allowing for finger input. (Don't worry, that signature red pointing stick hasn't gone anywhere.) So is this basically just an even better version of the original X1 Carbon? And is it worth that steep $1,499 starting price (a $250 premium over the non-touch version)? Let's find out. The X1 Carbon Touch is among the best Windows 8 Ultrabooks around, with a comfortable keyboard, fast performance and a lightweight build. Still, it's pricey, even for a high-end ultraportable. 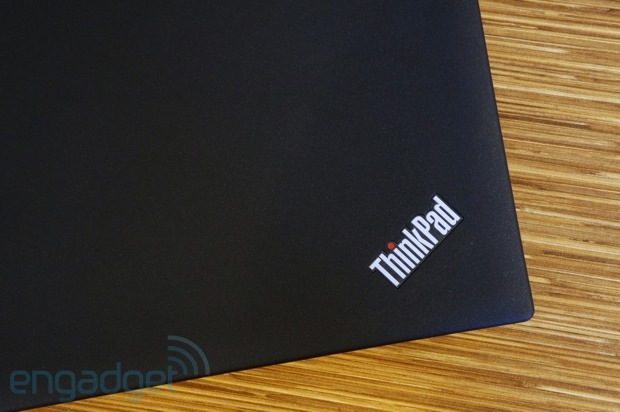 How would you rate the ThinkPad X1 Carbon Touch? If you're looking for something with this big a screen and this light a frame, your options have already dwindled. There's a reason this too is called the X1 Carbon: it has the same look and feel as its predecessor, with a black, soft-touch finish, slightly rounded edges and a simple layout that includes very few vents or openings. It's just as durable, too, with a rock-solid palm rest and a display that's not prone to wobbling or shaking. The latchless lid stays put, too, though it's thankfully easy to open. All told, this looks exactly the way you'd expect a ThinkPad to look: monotone and buttoned-up, with clean lines and angular shapes. That said, it is, perhaps, more minimal in appearance than that old T410 you have lying around your home office. The main difference here is that the Carbon's chassis isn't quite as impressively thin or light as it was the first time around -- a necessary concession when touchscreens are involved. As a result of that touch panel, the wedge-shaped body now measures 0.74 inch at its thicket point, up from 0.71 inch. Naturally, too, it's heavier: 3.4 pounds, versus three for the non-touch model. But before we start obsessing over tenths of a pound, let's get a little perspective here: we've seen 13-inch Ultrabooks that weigh more than this, so it's especially impressive to find a 14-incher this lightweight. (For comparison's sake, the 14-inch HP EliteBook Folio business Ultrabook weighs in at 3.6 pounds.) What's more, the X1 Carbon-series laptops are on the small side for 14-inch laptops, as they have thin bezels that make it possible to able to cram a 14-inch screen into a chassis normally reserved for 13-inch machines. It's true we've seen this technique used before, but it's still fairly rare. Basically, then, if you're looking for something with this big a screen and this light a frame, your options have already dwindled. We mentioned that the X1 Carbon Touch is light on vents and grilles, but it does still sport a handful of physical buttons, most of them situated just above the keyboard. Aside from the power button, these include keys for muting the volume or just silencing the mic, in the event you're on a VoIP call. There's also a volume rocker up there, though all the other multimedia controls (skip, pause, etc.) are built into the Function keys at the top of the keyboard. Additionally, there's a fingerprint reader on the palm rest and a toggle on the left edge for putting the machine into airplane mode (you wouldn't want to make the plane crash, now would you?). Other than that, the port selection is modest, but it should still tick off most of your checkboxes. On board, you've got two USB sockets (one 2.0, one 3.0), a headphone / mic jack, a Mini DisplayPort, a lock slot and a 4-in-1 memory card reader. The charging port, located on the back-left edge, is rectangular in shape, similar to a USB port, but we're just adding that for human interest: after all, we're used to proprietary charging gear on laptops. The machine also ships with a USB-to-Ethernet adapter, in case you have the chance to get on a faster wired network. And if it's VGA connectivity you're after, you can add a Mini DisplayPort-to-VGA dongle for $35 while you're configuring your system online. Something tells us we're about to preach to the choir: if you're a ThinkPad diehard hell-bent on buying another ThinkPad, it's probably because of the stellar typing experience (that or the build quality, but humor us here). This is the same spill-resistant, six-row keyboard you'll find on other new ThinkPads, complete with U-shaped "Smile" keys. Aside from the fact that this is a chiclet-style setup (a big departure from the older ThinkPad keyboard), the big difference here is that the keys boast 30 percent more surface area than on the older layout. Indeed, particularly on a slightly bigger-screened ThinkPad like this, the buttons feel well-spaced -- so much so that you'll never be in danger of hitting the wrong one by mistake. The only exception might be the left Ctrl key, which has been shrunken to fit the 13-inch-wide keyboard deck. It's not like we ever missed it, per se, but it can still be tough to find when you're trying to pull off standard keyboard shortcuts. 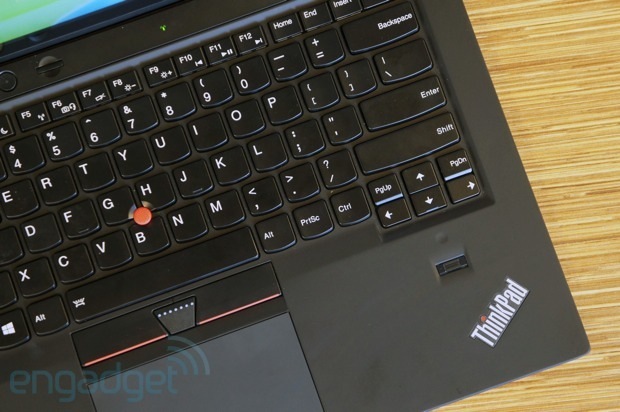 If you're planning on upgrading from an older ThinkPad, you can take some comfort in this: Lenovo claims that although the keys are now arranged in a chiclet pattern, the actual typing experience shouldn't feel that different from typing on the old layout. We know some ThinkPad fans who swear that's not true but, no matter. Regardless of whether it actually feels like the old ThinkPad keyboard, the new one delivers feedback that's springy -- forceful, even. It remains one of our favorite laptop keyboards, and it's definitely a better typing experience than what you'll get on other Ultrabooks, most of which make do with shallow, lifeless keys. 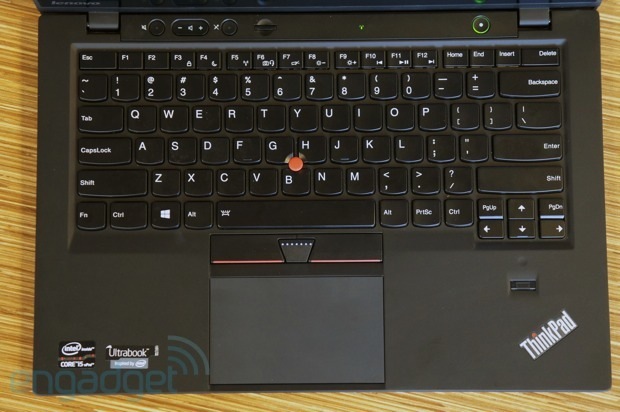 One last thing: the keyboard is backlit, which isn't true of all ThinkPads (see: the lower-end ThinkPad Twist). 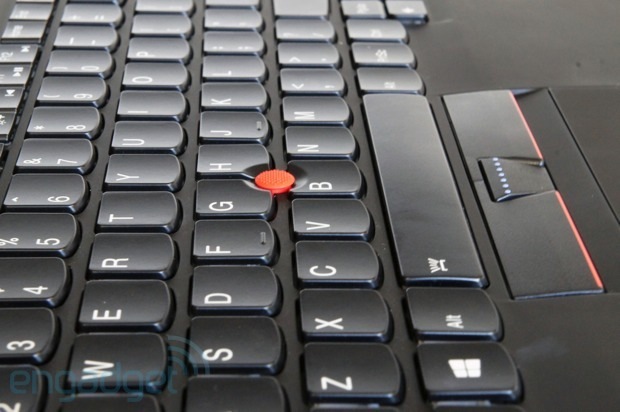 The red pointing stick, too, is the same one you'll find on other new ThinkPad systems. Though other companies like HP include something similar on their business machines, Lenovo's iteration remains our favorite: thanks to a fine pattern of raised dots on top, you can comfortably rest your finger there without worrying about it slipping off. In fact, as odd as the pointing stick may seem to people who don't use ThinkPads, we actually prefer it to the traditional touchpad -- the tracking is just that precise. The spacious glass trackpad is another good alternative to constantly using your fingers. It has a slightly rubbery finish, which adds just a hint of resistance as you're swiping in from the sides and dragging your cursor finger around. In general, that little bit of friction is a good thing: it makes everything from simple cursor navigation to two-finger scrolling feel more controlled. That said, this doesn't mean there isn't room for fine-tuning: occasionally it mistakes regular single-finger navigation for a different kind of gesture, the one where you swipe in from the top or bottom of the trackpad to expose app settings. Back when we reviewed the original X1 Carbon, we came away slightly underwhelmed by the display, its fairly high 1,600 x 900 resolution be damned. For one thing, the viewing angles were limited and the whites seemed a tad gray-tinged compared to other notebooks. Here, too, Lenovo went with a 300-nit, 16:9 display, and indeed, some of the same issues remain. The white balance thing is still apparent, for instance, though you'd have to be doing a side-by-side comparison with another laptop to really appreciate the difference (and even then, it really is quite minor). The viewing angles actually seem narrower this time around, but that makes sense given that Lenovo moved from a matte display to a slightly more reflective panel. Even if you don't plan on crowding around with friends to stream Netflix, you might notice it when you're trying to work with the notebook in your lap: the screen starts to wash out as you dip it forward. Under duress (say, a cramped airline seat) you could still get stuff done, but it wouldn't be the comfiest viewing experience. On the plus side, that new touchscreen is delightfully responsive to both swipes and taps. In fact, Lenovo seems to have applied a finish that gives the panel a little more texture than other touchscreens we've played with. We appreciate it the way we do a finely tuned touchpad: you wouldn't want too much friction while swiping around, but that little bit of traction makes finger input feel a little more controlled, a little more precise. Lenovo seems to have applied a finish that gives the panel a little more texture than other touchscreens we've played with. As far as audio is concerned, the X1 Carbon-series laptops were mostly designed with teleconferencing in mind (exhibit A: that dedicated mic-muting button). In that regard, the machine does its part: our friends said we came in loud and clear, albeit with a slight echo (nothing distracting, though). On the video side, the picture from the 720p webcam was apparently a bit pixelated, but our callers told us they didn't notice any stuttering or drops in the audio-to-video syncing. All told, the quality didn't seem to be any better or worse than any other Skype call, which is to say it's totally workable for some long-distance conferencing. To be honest, music playback is workable, too, though we're going to assume you either have no other listening options or just aren't that picky. As with so many other laptops (especially ultraportables), the audio is thin and tinny, as if it were trapped behind the speaker grille. Even at a high volume, it's not a very forceful sort of sound. For example, whereas a median volume setting might normally suffice when it's just me sitting in a quiet room, here we kept the volume set to about 75 out of 100. When I left my couch to do something in another room, I had to pump the volume to its max setting so that I could comfortably hear from across my (very small) apartment. Still, that weakness bothered us most after we switched from another laptop, one with a more robust set of speakers. After an hour of streaming songs on Slacker, though, we just sort of got used to it. And we think you will too, especially if you're using this in a hotel room and have no other options, save for your smartphone (and good luck relying on that as an alternative). And the truth is, we'd say this of most notebooks we review. There's simply that much room there for PC makers to improve. Happily for us reviewers, PC makers have been using many of the same components in their Windows 8 Ultrabooks, which makes it easy to draw neat apples-to-apples comparisons. 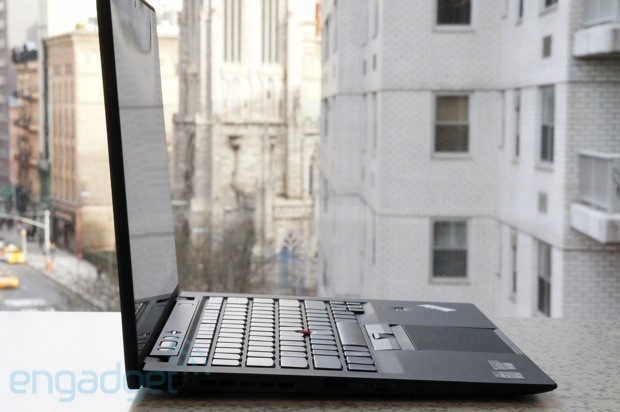 In this case, the X1 Carbon Touch we tested had a Core i5-3427U processor, clocked at 1.8GHz, along with 4GB of RAM. It also had a 180GB Intel-made SSD -- apparently the same one used in the HP EliteBook Folio 9470 we just reviewed. Given that we've seen these components in so many other machines, could we really have expected the performance here to be any faster or slower? As you might've guessed, the X1 Carbon Touch basically matches competing offerings, with similar scores in everything from PCMark 7 to 3DMark11. Which is to say, it's fast. The machine boots into the Start screen in 11 seconds, which is pretty typical for a Windows 8 machine with specs like these. We also found that the solid-state drive delivers equally strong read and write speeds (551 MB/s and 518 MB/s, respectively), which we noticed the last time we tested an Ultrabook with an Intel SSD. In short, the X1 Carbon Touch performs well in its own right but it also reminds us, once again, that this is a great time to be in the market for a Windows laptop. After all, who ever thought an 11-second boot time and 500 MB/s would constitute merely average performance? We've got some good news and bad news. First, the bad: the X1 Carbon Touch's built-in 45Wh battery lasted just five hours in our rundown test, which involves looping a movie off the local disk with WiFi on and the brightness fixed at 65 percent. Granted, touchscreen Windows 8 laptops generally don't fare well in this regard (the best lasted 5:32) but even then, a five-hour runtime is slightly troubling. 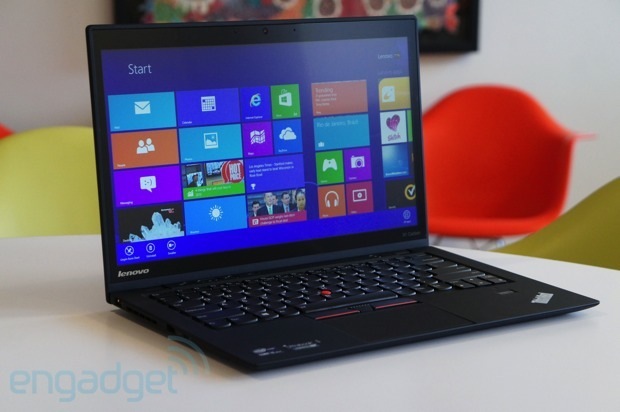 On the bright side, though, its endurance is almost identical to the non-touch version of the X1 Carbon. That certainly came as a surprise to us, given that a touchscreen usually spells doom for a laptop's battery life. We know, we know: that won't be of much comfort to people who are cross-shopping the X1 Carbon Touch with other Windows 8 Ultrabooks. But, if you're comparing this to the non-touch version, you can safely choose the touch model knowing you won't be taking a hit in battery life. Some other good news: the X1 Carbon Touch makes use of Lenovo's RapidCharge technology, which in this case promises to recharge the battery to about 80 percent in 35 minutes. So while you might want to take your charger with you at all times, you at least won't be using it for long stretches. We're not so naive that we expect to find zero crapware on a business PC, but we do expect them to come with fewer pre-installed programs than your typical consumer machine. Sure enough, Lenovo went relatively easy on the bloatware, though it did take the opportunity to throw in a handful of programs. Starting with Metro-style apps, there's Skype, Skitch, Evernote, Amazon Kindle, AccuWeather.com and the streaming service rara.com. Other software includes Intel's AppUp app store, Microsoft Office, a trial of Norton Internet Security and Lenovo Cloud, which is powered by SugarSync on the back end. Like most other Ultrabooks, the X1 Carbon Touch also has Intel's Wireless Display technology built in, which allows you to stream 1080p content to a monitor or HDTV, as well as mirror your desktop. As ever, that requires a small third-party adapter, which you'll need to buy separately. Lenovo also bundled a couple apps of its own, most of them designed to provide a little built-in support, particularly for business folks who don't have an IT staff on call. The more useful of these is the aptly named Lenovo Support, for which you'll find a Live Tile on the Start Menu. You might also appreciate Lenovo's Solution Center, which has a shortcut pinned to the Taskbar on the desktop. 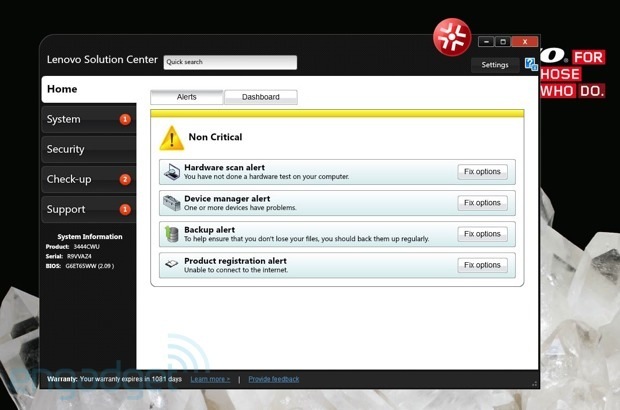 There, you'll find tools related to security, system settings and troubleshooting. There's also Lenovo Companion, but with tiles for the Lenovo Blog, a "product showcase" and curated apps, it's little more than a self-promotion hub. On a less cynical note, Lenovo smartly included a shortcut button above the keyboard that allows you to access lots of key hardware and software settings in one place. The X1 Carbon Touch comes standard with a one-year warranty, including phone support and mail-away repair service. (For comparison's sake, the HP EliteBook Folio starts at a lower $1,049 with a three-year warrant, though that doesn't have a touchscreen, which might be a crucial spec for you.) If you like, though, during the configuration process you can extend the warranty to up to four years, as well as add on-site repairs and accidental damage coverage. Though the X1 Carbon Touch technically has a starting MSRP of $1,499, it's currently going for $1,319 on Lenovo.com with instant savings. That entry-level configuration is similar to the one we tested, with a Core i5 processor, 4GB of RAM and a 128GB SSD. In any case, that base configuration comes with Windows 8 Home Premium, but you can upgrade to Pro for an extra 50 bucks. You can also step up to a 180GB SSD, which is what we tested. That'll cost you an extra $70. If you want more storage, you can buy an Intel-made 240GB drive ($230) or a 256GB disk ($280). Additionally, Lenovo says it will soon be offering its X1 Carbon-series laptops with i7 processors and 8GB of RAM, though a company rep declined to say just what the upgrade costs will be. Finally, of course, if that touchscreen seems overrated after all, you can always pick up the regular X1 Carbon, which has a lower starting price of $1,249 (currently $1,099 and up on Lenovo.com). It depends on who you are and why you like ThinkPads, we suppose. If you're homing in on this because you're looking for a business machine in particular, you're going to find slim pickings, we have to say. 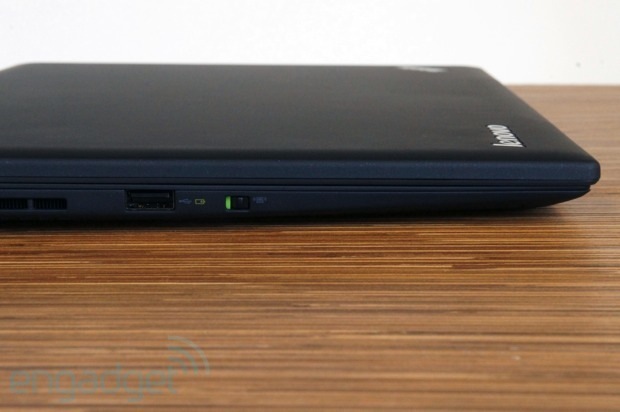 We don't know of many business-specific Ultrabooks, especially high-end ones such as this. One we can recommend is the HP EliteBook Folio 9470 ($1,049+), which offers similarly fast performance, along with an extra hour of battery life. Our main reservations are that it has a lower-res, 1,366 x 768 screen. Also, it isn't offered with a touchscreen, if that matters to you. Nothing has a better keyboard than this, and while the battery life here stinks, it stinks on every touchscreen laptop we've tested recently. While you're at it, take a look at the Dell XPS 13 ($1,000 and up) and XPS 14 ($1,100-plus), which offer business-oriented features like TPM, asset tagging, corporate images and custom BIOS -- all for a considerably lower starting price. The XPS 14 in particular offers relatively strong graphics performance and decent battery life, though we like the design and comfortable keyboard either way. 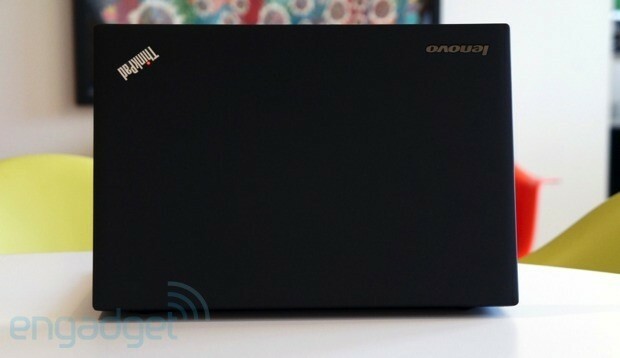 But what if you're just looking for the best touchscreen Ultrabook? In that case, the ThinkPad X1 Carbon doesn't have all that much competition, we're afraid. The reason being: nothing has a better keyboard than this, and while the battery life here sort of stinks, it stinks on every touchscreen laptop we've tested recently. And, as we said, they're all about equally fast, both in terms of benchmark scores and more mundane metrics, like startup times. So until something better comes along, the playing field is largely even, save for a few important factors: keyboard, trackpad, display quality and the overall design (weight, thinness, et cetera). What's that? You want us to name an alternative anyway? Okay, fine. The standout touchscreen Ultrabook so far is the IdeaPad Yoga 13 -- also made by Lenovo, incidentally. That goes for about $1,000 and up and has a similarly good keyboard, along with a 1,600 x 900 screen and slightly longer battery life. If you can make do with a smaller screen size, we're also big fans of the Dell XPS 12 ($1,200 and up), which has a comfy keyboard, fast performance, a lovely 1080p IPS display and relatively long battery life (for a touchscreen Ultrabook, anyway). Leaving battery life aside, then, we can instead focus on things like the keyboard, trackpad, performance and build quality -- all areas where the X1 Carbon excels. Starting with ergonomics, this has one of the best keyboard / touchpad combinations we've seen on a laptop, and that's not even counting that signature red pointing stick. We're also enamored with the design: aside from being well-made, the X1 Carbon Touch is also notably thin and light for a 14-inch machine, especially one with a touchscreen. The display is hardly our favorite, what with the narrow viewing angles, but at least the 1,600 x 900 resolution is nice and crisp. So, there's really no question this is a solid laptop. An imperfect laptop, yes, but a solid choice nonetheless. The only remaining problem is the cost. At $1,499 ($1,319 with instant savings), this isn't cheap for an Ultrabook with a Core i5 processor, 4GB of RAM and 128GB of storage. Heck, it doesn't even have a three-year warranty to help justify the cost. It's just an expensive laptop -- expensive even for a high-end Ultrabook. If money were no object, we'd suggest you get the X1 Carbon Touch over the regular, non-touch X1 Carbon, but given the big gap in price, we'd understand if you chose the older version anyway. You might also want to check out the Dell XPS 12 ($1,200+) and Lenovo's own IdeaPad Yoga 13 ($1,000 and up), both of which have high-res touchscreens, fast performance, comfortable keyboards and relatively long battery life. Or, you know, you could wait for Lenovo to cut the price. It's only a matter of time, right?